Limit entries in any event, if necessary, in order to manage session length. If it's necessary to limit entries, teams will be notified by Tuesday, April 27th, and refunds will be given. Combine events in which there are insufficient entries. Age on April 30th, 2004, will determine the swimmer's age for the entire meet. An athlete may only compete in his/her own age division. USA Swimming registered teams will be invited to participate. If your club would like an invitation to this meet please contact the Meet Director. To be eligible to enter this meet, a swimmer must be registered with USA Swimming and their LSC, no later than the entry deadline. On-deck registration will NOT be allowed. Continual warm-up/warm down facilities are available throughout the meet (except during open and assigned warm-up times). Assigned warm-ups to commence immediately following the conclusion of the morning sessions #2 and #5, but not earlier than 11:30am. Competition will begin 90 minutes after the start of warm-ups. Accurate timeline projection will be made available after all entries have been received. Session timelines will be sent electronically to all attending teams, with their Warm-Up lane assignments and Lane Timer Assignments by Tuesday April 27th. Open warm-up to commence immediately following the conclusion of session #3, but not earlier than 4:30pm. Competition will begin 45 minutes after the start of warm-ups. Session timelines will be sent to all attending teams, with their Warm-Up lane assignments and Lane Timer Assignments by Tuesday April 27th. The pool will be configured to conduct competition in 8-lane, 50meter pool. All events will be swum as TIMED FINALS. All events 200m or longer, will require POSITIVE CHECK-IN. Events #1 - #4 and #53 & #54 will be swum fastest to slowest, alternating girls and boys. Overhead starts may be used to manage the length of each session. Current USA Swimming Rules and Regulations will apply. § Positive check-in is required for all events 200m and longer. Positive check-in times may be adjusted due to the meet entry size and projected time-line. Accurate positive check-in deadlines will be sent electronically to all attending teams, with their Warm-Up lane assignments and Lane Timer Assignments by Tuesday April 27th. Events #41 - #44 due 30 minutes after the start of competition. Events #49 - #52 due 60 minutes after the start of competition. Events #53 & #54 due 15 minutes after the start of warm-ups. Events #59 & #60 – 7:30 a.m. Sun. Events #73 - #76 – 8:45 a.m. Sun. Events #93 - #100 due 60 minutes after the start of competition. § Coach’s packets (should be picked up at the beginning of the meet) will contain the check-in reports for each event (listed above). § Coaches are required to update the check-in reports for each session, and return the reports to the Admin Table by the above deadlines. Coaches must have current USA Swimming credentials visible at all times while on-deck. Coaches Packets will be available at the Admin Table. $ 3.00 surcharge per swimmer. $ 5.00 per individual event. Team entries will not be processed until payment has been received. USA Swimming certified officials are requested for all positions. All certified officials wishing to volunteer to work this meet please contact the FISH Officials Chairman, Tony Fitz, at (703) 437-7378 or tfitz@cox.net prior to Saturday April 24th. Please include your club affiliation, certifications held, and sessions you wish to work. Officials assigned to this meet should sign in at the Admin table at the start of the Warm-up. Certified officials, who have not been contacted, should volunteer their services to the Referee. While on deck Officials must have current credentials visible at all times. No late or deck entries will be accepted. The meet will be capped at 850 swimmers. Sessions #2, #3, #5 and #6 (SAT & SUN Mornings and Afternoons) are limited to a maximum of 400 swimmers per session. Entries in events #1 & #2 (12&Y 400m Free) are limited to a maximum of 2 hours. Entries in events #3 & #4 (13&O 800m Free) are limited to a maximum of 2 hours. Entries in events #53 & #54 (13&O 1500m Free) are limited to a maximum of 3 hours. Entry into events #1 & #2 is limited to those swimmers who have a current time of BB or faster in the 12 & Y 400 Free, or time of record equal to BB or faster in the 200 Free for their current age-group (No estimated COACHES TIMES will be allowed). Entry into events #3 & #4 is limited to those swimmers who have a current time of BB or faster in the 13&O 800 Free, or time of record equal to BB or faster in the 400m/500yd Free for their current age-group (No estimated COACHES TIMES will be allowed). Entry into events #53 & #54 is limited to those swimmers who have a current time of BB or faster in the 13&O 1500 Free, or time of record equal to BB or faster in the 400m/500yd Free for their current age-group (No estimated COACHES TIMES will be allowed). Swimmers may enter and swim a maximum of 3 individual events in any one session, but no more than 4 individual events during ONE day. Entries MUST be submitted in LC METERS times. To maximize the timeline, every swimmer must be entered with a previously earned LCM time, or a converted time (SCY or SCM times converted to LCM times), or an accurate, estimated COACHES TIME (except where stated above). If a swimmer exceeds the maximum entries, the last event, by numerical order, will be dropped. Entries will be accepted on a first-come, first-served basis. It is anticipated that this meet will be fully entered. DEADLINE for receipt of entries is 6pm, Tuesday, April 20th, 2004. You are required to submit a Hy-Tek Team Manager Meet Entry Report, listing all your entered swimmers and the events your swimmers have been entered in. Entries may be mailed on a 3.5" computer disk using Commlink on HY-TEK Team Manager computer software, or may be e-mailed in .zip file format. With each team's entries submission, each team is required to submit the CLUB ENTRY COVER SHEET & PERSON OF CONTACT REPORT (page 5 of this meet announcement). Refunds will be made to anyone cut from an event by the Meet Director, because of a need to limit competition. Swimmers entered with USA “A” times or faster will receive ribbons for 1st – 8th place. Swimmers entered with USA “BB” times and slower than USA “A” times will receive ribbons for 1st – 8th place. Swimmers with times slower than USA “BB” times will be receive ribbons for 1st – 8th place. Each club is responsible for supervising the conduct of their swimmers. Swimmers are not permitted in any area not directly associated with the swim meet. All others are required to be in the elevated spectator bleachers. The host club is responsible for supplying one timer per lane and the attending teams will be assigned a pro-rata share of lanes to staff with lane timers. The information for attending team's lane assignments and number of lane timers required will be electronically sent out to all teams by Tuesday, April 27th. Lane Timers will meet 15 minutes prior to the start of each session's competition (except for the evening distance sessions). Friday evening Session #1 and Saturday evening Session #4 swimmers are required to provide their own timers, and if desired, a counter. PVS warm-up and safety procedures will be in effect during this meet. 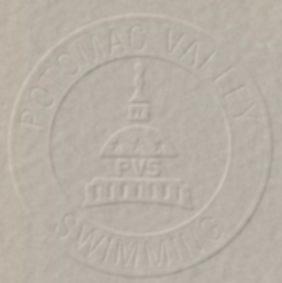 These procedures may be found at www.pvswim.org. Deck Marshals will be assigned to supervise the warm-up sessions, and have the authority to remove any swimmer, coach, or club from the warm-up who does not follow the safety rules. Athletes who have not been checked-in prior to the specified time will be scratched from the event. Athletes who have been checked-in, have been seeded, and fail to swim the event will be barred from their next scheduled individual event, unless excused by the Referee. Heat sheets will be available. A Hospitality area will be available for USA Swimming officials and coaches. PRO SHOP may be available. We have secured a special meet rate at the Comfort-Inn University Center for both teams and families. It is located approximately 2 miles from the George Mason – Aquatic and Fitness Center. Please contact Sandra Puebla at (703) 591-5900 and specify that you are with the meet. Name of your team's LANE TIMER COORDINATOR (the person who will be AT this meet to coordinate your team's lane timers). Name and Address of TEAM ENTRIES PERSON OF CONTACT.